The new MacBook Pro is, like all modern MacBooks, an exquisitely designed and executed productivity machine. And like every successive MacBook generation, it's better than the one that came before —with some caveats. For 2016, Apple amplified, refined and tuned hardware to the highest degree. Tight tolerances dictated by Apple's design are immediately evident, from the new butterfly mechanism keys to cleanly milled ports to a precise fit and finish. Design, material choice and build quality come together to form a literally solid laptop. The Late-2016 MacBook Pro is in many ways an augmentation of the industrial design introduced with last year's 12-inch MacBook, both aesthetically and functionally. Apple carries forward the squared-off clamshell motif —with rounded corners, of course —but pancakes the entire device down to a mere 0.59 inches tall. By comparison, the early-2015 13-inch MacBook Pro came in at 0.71 inches tall, while the 12-inch MacBook is 0.52 inches at its tallest point. Despite an incredibly slim chassis, flexure and torsion are near zero, on par with previous MacBook Pro models and a vast improvement over the MacBook Air line. New for 2016 is an all-metal hinge that not only delivers a more uniform aluminum aesthetic, but comes with the added bonus of enhanced structural integrity. Previous generation MacBooks, including outgoing MacBook Pro models, featured a plastic hinge enclosure that, while sturdy, tends to creak with extended use. Inside, Apple retained its patented silky-smooth clutch mechanism for easy opening and closing. Opening the new MacBook Pro reveals a litany of design tweaks that brings the line more in step with the 12-inch MacBook. The most apparent change is a revamped keyboard boasting second-generation butterfly mechanism keys (more on this later). 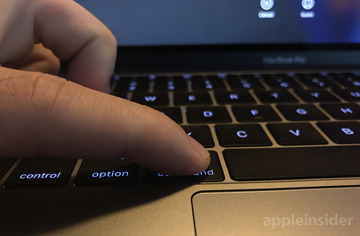 Introduced with MacBook in 2015, Apple's butterfly keys are much larger and feature a decreased key pitch as compared to the chiclet-style keys found in previous MacBook Pros. 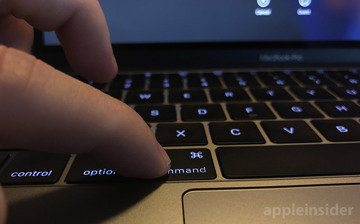 To fit the full-size keyboard into MacBook Pro's smaller frame, which shrunk from a footprint of 12.35 inches-by-8.62 inches in 2015 to 11.97 inches-by-8.36 inches this year, Apple adopts a key layout debuted with the 12-inch MacBook. For example, all four arrow keys now fit into the space of three normal QWERTY keys, with full-size left and right buttons flanking a split pair of up and down keys. 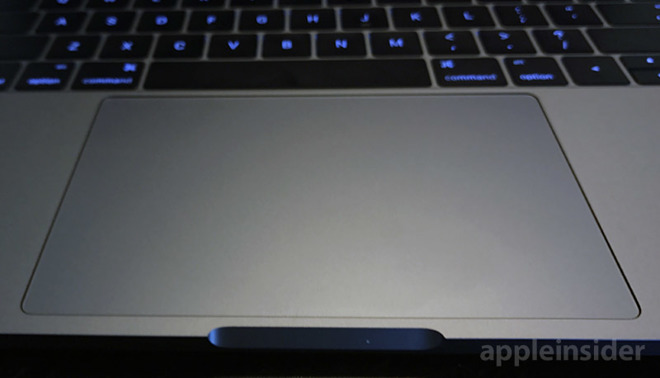 Making the fit even tighter is an extra-large Force Touch trackpad, which for reference sports an active area larger than an iPhone 7 Plus' 5.5-inch screen. 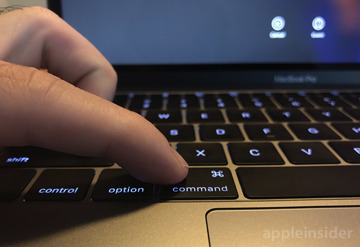 The enlarged trackpad sits just millimeters away from the spacebar, command and option keys, and an equal distance away from the finger notch that assists users in opening MacBook Pro's display. Emblazoned on each backlit key are letters and glyphs accomplished in Apple's San Francisco typeface, a theme becoming increasingly common as the company moves away from Helvetica Neue. Even the "MacBook Pro" logo sitting just below the notebook's Retina display is in San Francisco, as is text on the computer's packaging and accompanying documents. Nonfunctional changes include the removal of the iconic backlit Apple logo which graced MacBook Pro models for years. 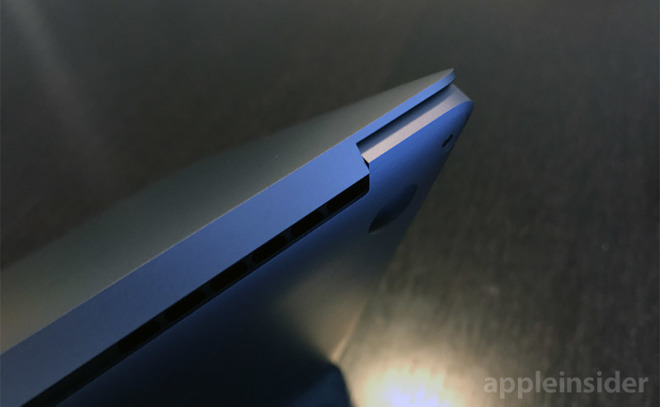 Taking its place is a shiny aluminum insert, mimicking the look of the MacBook. For this review, we tested a 13-inch MacBook Pro equipped with a 2-gigahertz Intel Core i5 CPU, Intel Iris Graphics 540 integrated graphics chip, 8 gigabytes of 1866MHz LPDDR3 RAM and 256 gigabytes of PCIe-based SSD storage. The baseline configuration comes in at $1,499. 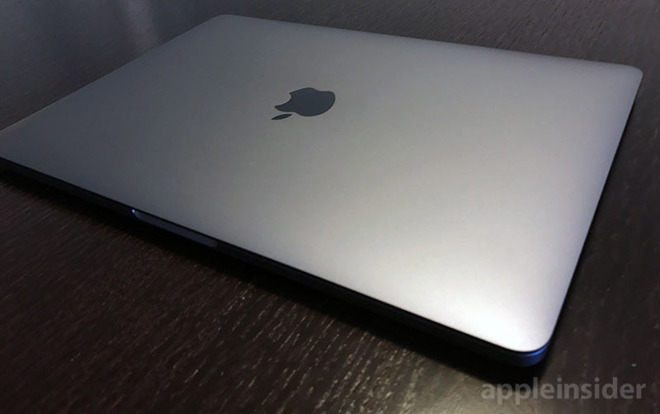 At the heart of this particular MacBook Pro testbed is Intel's sixth-generation i5-6360U, a processor that first hit the streets in the third quarter of 2015. At first blush, a one-year-old processor might seem an odd choice for a laptop marketed as a "pro" laptop, but the silicon is the latest offering from Intel and more than enough to handle currently available apps. Our machine rated a decent single-core score of 3,691 points and 7,148 points on the latest version of Geekbench 4, outperforming last year's 13-inch MacBook Pro with higher-clocked fifth-generation Intel CPUs. The machine managed 28,127 points in Geekbench's compute benchmark, which measures GPU performance using OpenCL. While the CPU and integrated GPU are evolutionary updates, the latest MacBook Pro comes with next-generation NVMe storage. The SSD and controller are capable of reaching sequential read speeds of 3.1 gigabytes per second and write speeds of 2.1 gigabytes per second, far exceeding competing Windows machines. More importantly, the storage technology helps to alleviate perceived system slowdowns blamed on MacBook Pro's 16GB RAM ceiling. Putting the computer through its paces, we cut high-resolution video, batch processed image files in Lightroom and performed complex editing operations in Photoshop. Most operations went smoothly, though batch processing and video editing did momentarily cue the spinning beach ball of death, likely due to our system's 8GB of RAM. A laptop's keyboard is arguably its most important user-facing feature. As mentioned above, the new MacBook Pro features a keyboard first introduced with MacBook last year. Specifically, both laptops employ keys designed around the butterfly mechanism, a take on traditional scissor-switch keys that allows for low-profile installations. While it helps shoehorn functional keys into a super-thin chassis, the butterfly mechanism is less tactile and offers decidedly shallow displacement than conventional switch types. Users have taken notice, as evidenced by complaints regarding the restrictive 0.55mm key travel seen with the past two MacBook versions. The second-generation butterfly mechanism is in part a response to those critics. While key travel specifics appear to be unchanged, the new MacBook Pro integrates a tuned dome switch part that feels more "clicky" and responsive than the first-generation iteration. In practice, the new keys fall closer to MacBook's low-displacement units than the vaunted MacBook Pro QWERTY keyboard of yore. That being said, the keys are definitely workable. Moving from the aforementioned previous-generation MacBook Pro, we adapted quickly to the new keyboard feel and layout, and were typing at speed within minutes. Sitting just below the redesigned keyboard is a gigantic Force Touch trackpad. Built to accommodate a wide variety of gestures within macOS Sierra, we found the enlarged touchpad to offer improved navigation and control of first-party apps like iMovie and Photos. The extra surface area also proved useful in image editing software like Adobe's Photoshop CC. With any large trackpad, especially one with Force Touch technology capable of detecting presses anywhere on its surface, effective palm rejection technology is key. Most users will find their palm and first metacarpal (first bone of the thumb) rest directly over the top corners of the trackpad, in some cases touching the touch sensitive surface. To thwart errant inputs, Apple appears to be using touchpad algorithms similar to those deployed with previous Force Touch units. Importantly, the trackpad intelligently ignores large swaths of skin —palms —while at the same time remaining receptive to input from smaller capacitive signals generated by fingers. For example, laying one's left palm on the trackpad does not register as a press, but touching and pressing down on the surface with a fingertip —even if the left palm is still in contact —will invoke an expected input event, including system gestures that require multiple fingers. All in all, MacBook Pro's jumbo-size trackpad is among the best upgrades MacBook Pro has seen in years. It's easily accessible, responsive, intuitive and plays well with both first- and third-party macOS apps. Also new to the MacBook Pro series, and Macs in general, is a Retina display with support for the DCI-P3 color space, or as Apple calls it, Wide Color. The new feature, borrowed from iPhone 7, faithfully reproduces wide color gamut images, a plus for digital imaging professionals. Depending on your workflow or content viewing preferences you might not be able to readily take advantage of wider gamut support. Still, with Apple pushing to incorporate the DCI-P3 standard across its device lineup, content providers and app makers are sure to take notice. Beyond a wider color space, the 13.3-inch LED-backlit display features the same 2,560-by-1,600 pixel native resolution and IPS technology as last year's 13-inch Pro. This laptop's speakers are no joke. Apple promises "room filling sound" and the MacBook Pro delivers. Granted, laptop speakers will likely never serve as a replacement for studio monitors, because physics, but the Pro is more than adequate for all but the most demanding projects. Listening to lossless tracks, audio fidelity is clean across the board, from brilliant highs to full, if not booming, bass. Perhaps more impressive is sound quality from lossy, compressed files and streaming services. In our tests, even music from YouTube —a go-to source for free streaming music —was consistently clean and free of sonic anomalies that might crop up on lesser notebooks. Apple promises 10 hours of battery life and we consistently hit that number while surfing the web and performing menial background tasks. Viewing a movie on Netflix with screen brightness and audio output set to 75 percent drained power at the advertised rate, for example. Of course, more processor intensive applications like Photoshop and Premiere devoured MacBook Pro's battery in only a few hours. Still, the laptop will easily last a cross-country —or international —flight completely unplugged. Much has been said about Apple's decision to restrict MacBook Pro to Thunderbolt 3 ports —only two of which are included on the 13-inch model without Touch Bar —but we believe most users won't feel the pinch. Whereas past MacBook Pros featured a litany of I/O ports, from Thunderbolt to HDMI to USB, as well as an SD card slot, the current models max out at four Thunderbolt 3 inputs on Touch Bar versions. Apple is looking ahead to, and in many ways driving, the future of mobile computing. USB-C format devices will one day soon become the de facto standard in peripheral expansion and connectivity, or at least that's what Apple is banking on. It is clear that Thunderbolt 3 and USB 3.1 are heirs to their USB 2.0 and original Thunderbolt progenitors, and should show up as viable I/O options on most consumer hardware. This assumed format shift is unlikely to faze power users; those adept at daisy chaining external drives with monitors and a bevy of expensive equipment. We do, however, question whether it was good idea to force the same limitations on users looking to buy what is essentially a mid-tier laptop. 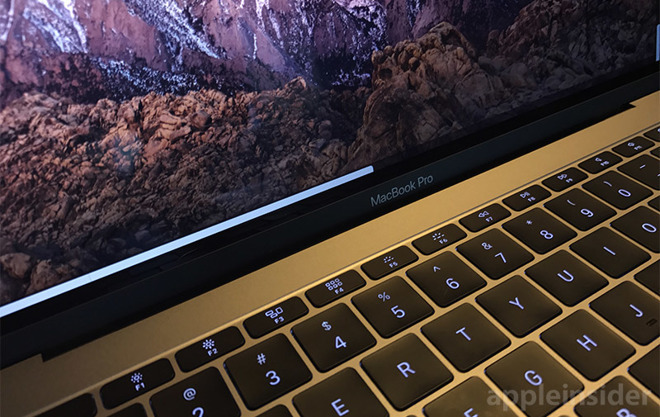 Though it is christened MacBook Pro, the 13-inch non-Touch Bar version lacks the computing horsepower and upgrade paths available to buyers going the Touch Bar route. For all intents and purposes, the laptop is an entry-level machine, and customers looking to buy one are less likely to own USB-C hardware. 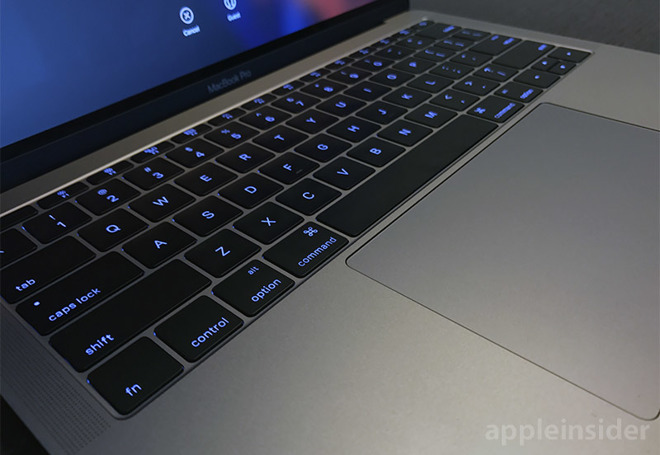 In essence, Apple is marketing the Touch Bar MacBook Pros to professionals who own the latest equipment, leaving the 13-inch entry-level iteration as a MacBook step-up model, or an aspirational product for consumers. Following that mindset, Apple might have been better served to include legacy ports on the mid-tier laptop. As it stands, Joe Q. Public will have to buy a USB-C to Lightning cable adapter just to sync their iPhone or iPad. And that's just for Lightning. Apple currently sells a number of adapters suitable for USB-C equipped MacBooks, including USB-C to USB, Thunderbolt 3 to Thunderbolt 2, USB-C Digital AV Multiport Adapter (for HDMI, etc.) and the USB-C VGA Multiport Adapter. 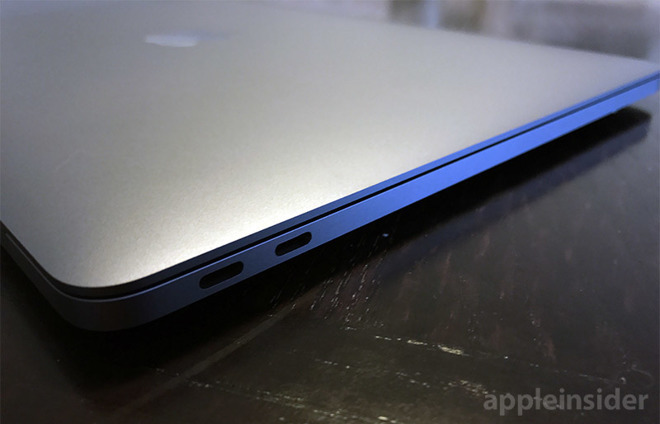 Apple provides at least one concession with MacBook Pro: a 3.5mm audio jack. Alone amid a blank slate of aluminum on the Pro's right chassis wall, the headphone jack sits. In this case, however, we agree with Apple's decision to keep the jack in play for pros who need to connect audio hardware like microphones, monitors and mixers. Overall, the 13-inch MacBook Pro without Touch Bar is an achievement in industrial design that fulfills Apple's commitment to usability and user experience. It is a happy middle ground between the thin-and-light 12-inch MacBook (MacBook Air is going away very soon, folks) and Apple's top-of-the-line 13- and 15-inch MacBook Pro models with Touch Bar. Though not the most powerful machine, the entry level Pro is more than sufficient for most users. Road warriors, coffee shop heroes and consumers who dabble in image and video editing are well served by the system's mix of performance and battery life. Still, $1,499 is a steep price to pay for what can be considered evolutionary upgrades. Factoring in price points from past releases, new MacBook Pro costs are in some ways only justified by internal additions to top-tier Touch Bar models. Potential buyers should also take into account the lack of built-in expandability. Depending on use case, users might have to spend hundreds of dollars on adapters. That being said, the 13-inch Pro without Touch Bar fills a certain niche. If, for example, you're looking to replace an aging MacBook used mainly for light photo and video editing, word processing and other casual tasks, and the 13-inch format suits your needs, the new non-Touch Bar model offers a nice set of features and decent future proofing. If you're looking for a small form factor professional machine capable of tackling anything from 4K video cutting to CAD apps and beyond, the 13-inch MacBook Pro with Touch Bar and uprated components is definitely a better fit. Apple's 13-inch MacBook Pro without Touch Bar fits right in the middle —in specs and price —between the $1,299 MacBook and the $1,799 13-inch MacBook Pro with Touch Bar. The base architecture is undoubtedly MacBook Pro, but whether or not consumer will bite at $1,499 remains to be seen. 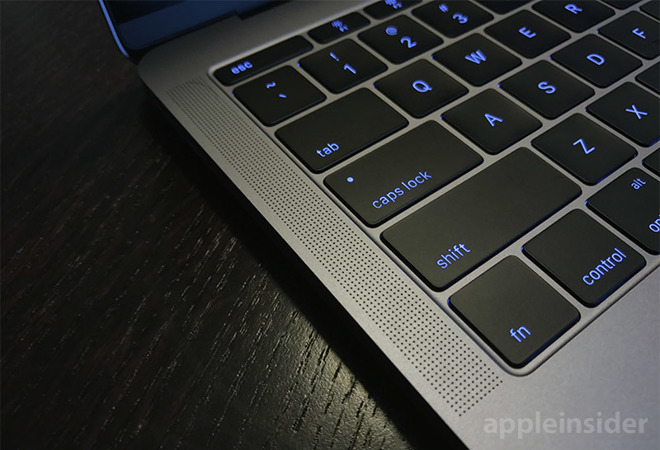 Apple's Late-2016 13" MacBook without Touch Bar comes in Silver and Space Gray and starts at $1,499.00 for a model with a 2GHz Core i5 processor with Intel Iris Graphics 540, 8GB of RAM and a 256GB SSD. On the other end of the spectrum, a maxed-out model with 2.4GHz Core i7 CPU, 16GB of RAM and 1TB of storage sells for $2,599.00, before tax (currently $200 off at B&H). Before purchasing your new MacBook, make sure to check out AppleInsider's Price Guides to find the lowest prices available for your desired configuration and see which Apple authorized resellers currently have the model in stock. As of press time, inventory of these new MacBook Pros are still making their way to resellers. For most shoppers, Apple authorized reseller and AppleInsider sponsor B&H Photo will offer the lowest net prices, as it does not collect sales tax on orders shipped outside NY state. B&H currently has 10 different configurations in stock with free shipping. The remaining models are available for pre-order and are expected to ship quickly.